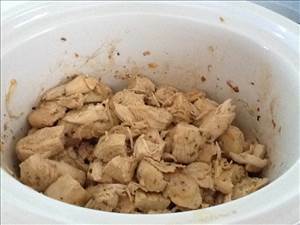 A slow cooker recipe for chicken. Pat chicken dry with paper towels. Combine oregano, seasoned salt, and pepper. Rub over chicken. Brown chicken in a skillet over medium heat. Let chicken rest 8 minutes then cut into 1" pieces. Place chicken in slow cooker. Combine water, lemon juice, garlic, and bouillon in skillet. Bring to boil, stirring to loosen browned bits. Pour over chicken. Cover. Cook on low 3-4 hours. Stir chicken. Remove lid and cook 15-30 minutes longer, allowing juices to thicken slightly. Add parsley. Serve chicken and juices over rice. 67 members have added this recipe to their cookbook. Makes 4- 1/2 cup servings. There are 227 calories in 1 serving of Lemon Chicken II. Calorie break-down: 34% fat, 8% carbs, 58% protein.